In a city burgeoning with fabulous hotels – and fabulously historic hotels, too – for Al Ponte Antico to be the recipient of so many exceptional reviews is a remarkable accolade. The building itself is said to date from the 1500’s and was originally a private palace. Its décor is very much in keeping with its rich Venetian heritage and all of its room types (defined as Classic, Superior, Deluxe, and Junior Suite) are lavishly furnished. However, perhaps what make’s Al Ponte Antico that little bit extra special is its extraordinary location: situated facing the Grand Canal with views of the Rialto Bridge. This, coupled with a reputation for excellent service, ensures that the overwhelming majority of those who stay here rate it as among Italy’s best hotels. 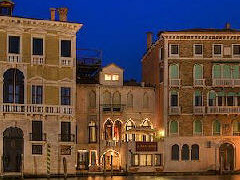 Privately owned, it offers only 9 guest rooms, each of which is named after one of the city’s famous bridges, including the Ponte delle Guglie, Ponte degli Scalzi, and the Ponte dell'Accademia. Meanwhile, its main public room - where breakfast is served - features an old hand-decorated ceiling and doors onto a private terrace overlooking the Grand Canal itself.